Amtrak Train Days kick off Saturday, May 9th. Rail travel’s growing role in American life is reason to celebrate. That’s exactly what train spotters and passengers will be doing in the days and months ahead as 2015’s Amtrak Train Days events roll out. Highlighting the Amtrak Train Days calendar is the Amtrak Exhibit Train which starts its national tour at Chicago Union Station on Saturday, May 9th. Amtrak celebrated its first National Train Day in 2008. Seven years later the event has expanded from a single National Train Day to an ongoing roster of Amtrak Train Days events in over 100 communities across the country. Amtrak Train Days events continue through the fall. Community events feature a range of activities and exhibits emphasizing the heritage, benefits, and fun of train travel in the US. 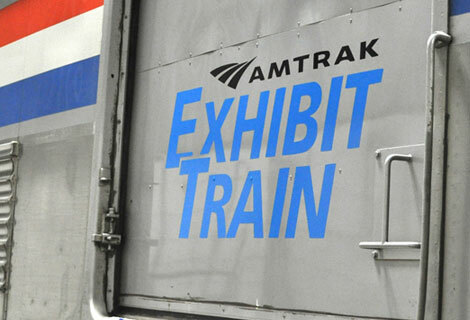 The Amtrak Exhibit Train Tour will visit selected train stations across the country. via Amtrak Train Days 2015 | Amtrak Exhibit Train Tour.